Two Southern Nevada towns rank as being among the best locations to operate a warehouse/distribution center in the western United States, according to a comparative corporate site selection study by The Boyd Co. that rated 25 sites. Of the two local sites, Mesquite comes in as the best site for a warehouse/distribution center based on annual operating costs of $13.7 million, while North Las Vegas ranks fifth with $14.6 million in annual operating costs. Factors that made Mesquite the most cost-efficient site include land costs ($80,500 per acre), effective tax rate ($9.71) and weighted hourly average ($13.55). All of those numbers were significantly lower than the other sites in the survey’s Western II grouping, which included North Las Vegas; Reno/Sparks; Ogden/Clearfield, Utah; and Salt Lake City. North Las Vegas’ biggest advantage is its lower shipping rates costs ($1.98 million) because of its accessibility to Interstate-15 and its closeness to the ports in Los Angeles. Mesquite’s rate comes in a close second at $2.04 million. Having easy access to those ports is key in today’s economy, especially after the proposal of the Trans-Pacific Partnership, which is still being hammered out in Washington, according to Boyd. “TPP is going to cause a new wave of exports to Asian countries, and these exports will be going through the ports of Los Angeles and Long Beach,” Boyd said. “So if you are one of the companies that want to serve Asia through these ports, you can also use that same warehouse to distribute to the 11 western states. Proximity to the U.S. southern border also helps local warehouse/distribution centers because Mexico is becoming the preferred offshore location for manufacturing because labor costs in China have risen 20 percent each year for the past five years, Boyd said. Mesquite already has access to I-15, but it will soon be getting easier to get on and off the major interstate that leads into Los Angeles. A new exit is being built at Mile Marker 118, which is at the southern end of the Mesquite Business Park. George Gault, interim president and chief executive officer of Mesquite Regional Business, a 501(c) 6 economic development corporation, said work has already started on the interchange and it should be completed by June 2016. Gault said Mesquite is 350 miles from the ports in Los Angeles and from Salt Lake City, making each a day’s drive. Mesquite is also attractive because it is 90 miles from Las Vegas, which has an intermodal terminal operated by Union Pacific Railroad. The Mesquite Technology and Commerce Center also has 700 acres that are utility-served for any company that wants to open a warehouse in the town, Gault said. A business park with 700 available acres that is already served with infrastructure such as utilities, fiber, water and sewer also makes Mesquite a strong candidate for any company that needs to open a warehouse/distribution center quickly. Mesquite also has plenty of water. “I was recently at a meeting in Las Vegas, and a commercial broker asked a large group sitting around the table, ‘If I had a 200,000-square-foot warehouse and it needed a hundred acres; where would I put it?’ I was the only guy around the table who raised my hand. The Las Vegas Valley is working right now to identify large sites that could be available for that sort of that thing,” Gault said. While Gault is excited about the opportunities this study opens up for Mesquite, he is concerned about two things that might affect Mesquite’s ability to attract a warehouse operation. The good thing is those concerns might already have a remedy. One of those concerns is the availability of skilled labor in Mesquite. Long gone are the days when a warehouse operation just meant jobs for heavy laborers and forklift drivers. These days, highly automated and computer-drive warehouse operations depend on a wide range of blue-collar employees and well-compensated white-collar employees who manage such sophisticated technologies as radio-frequency identification technology, automated storage and retrieval systems, mobile robotics, inventory tracking and software-driven pick-and-pack systems, according to the survey. Gault said the Nevada Career Center has federal workforce money that can help train potential employees for those jobs. There is also a College of Southern Nevada in Mesquite that could do some customized training for potential warehouse workers. Any site in Mesquite would most likely be a smaller, 200-person operation. Right now, Mesquite doesn’t have natural gas lines, but Gov. Brian Sandoval recently signed SB 151, which provides a mechanism for Southwest Gas to extend natural gas service to smaller market locations like Mesquite, Boyd said. Gault added that Southwest Gas has told them that if they have any leads on companies that need natural gas and want to move to Mesquite, the town has been authorized to say they will have gas to the company by the time its building is complete. For now, Mesquite is focused on smaller companies that don’t require a large labor force or natural gas. Mesquite may have been rated as the best location to operate a warehouse/distribution center in the western United States, but that doesn’t mean North Las Vegas is not an attractive option for companies. North Las Vegas ranks as the fifth-best site with $14.6 million in annual operating costs, according to a comparative corporate site selection study by The Boyd Co. that rated 25 sites. North Las Vegas’s annual operating costs were almost a million dollars more than those in Mesquite. Along with costs, easy access to Interstate 15 and being within a day’s drive of ports in Los Angeles and Long Beach are what makes Mesquite an attractive option. However, North Las Vegas has easier access to all of those things, although it is 90 miles farther from Salt Lake City. Plus, the Las Vegas metro area has a larger workforce to pull from for the highly automated and computer-drive warehouse operations that depend on a wide range of blue-collar employees and well-compensated white-collar employees who manage such sophisticated technologies as radio-frequency identification technology, automated storage and retrieval systems, mobile robotics, inventory tracking and software-driven pick-and-pack systems, according to the survey. One of the main reasons for the disparity between the two sites is the cost of property. For 30 acres in Mesquite, the cost is $2.4 million. In North Las Vegas, those 30 acres will cost $4.1 million. The tax rate also weighs heavily in favor of Mesquite as the yearly real property tax cost in the small town is $383,963, while the tax cost would be $501,294 in North Las Vegas. Of course, some of that disparity can be offset by tax incentives and other breaks to help attract business. <p? "North Las Vegas shows very well," Boyd said. "I wouldn't get hung up on being a little more expensive than Mesquite. This market, by western standards, is a very cost-efficient market. Mesquite land costs are so dramatically lower and that is tipping the scale. Labor costs are little lower in Mesquite. The takeaway is Southern Nevada period is well positioned to attract a new corporate investment from the logistics industry." John Ramous, senior vice president and regional manager of Harsch properties in Southern Nevada, said the report will prove how the area is a more cost-efficient platform for businesses and will make the area more competitive with the other markets mentioned. 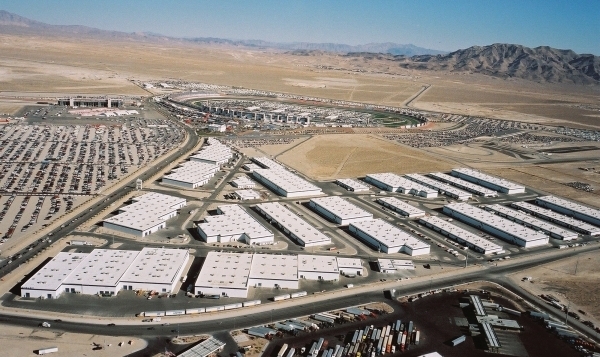 Harsch owns warehouse space at the second phase of the Speedway Commerce Center in North Las Vegas. Ramous pointed out the large plots of available acreage in North Las Vegas and the larger metro Las Vegas population pool that can help warehouse/distribution centers find qualified employees. He added that those resources could help pull in a “big box” distribution center like Amazon. Boyd pointed out that North Las Vegas and Mesquite are not necessarily competing against each other. He said the communities should target California companies that are looking to leave the state over its business climate.